Back in 2007, I was part of a radio show called “Keeping It Weird,” which gave us an excuse to visit different parts of San Diego and talk to people. One place that refused to talk to us was the Creationism Museum in beautiful Santee, California. In lieu of an actual interview, I just made one up to highlight their nonsensical logic that contradicts itself numerous times. US: We’re here at the Institute of Creation Research located in beautiful Santee, California. Nobody at the Institute was willing to talk to us so we’ve asked that a creation scientist from a nearby church guide us through the museum and answer some of our questions. This is Dean Archer, our museum guide. DEAN: I’m always happy to show people the good works of Our Lord and His creation. US: Before we go in, can you tell us a little about yourself? DEAN: Why yes! I graduated from the Institute of Creation Research’s master’s degree program in creationism biology and geology science. US: What kind of a job can you get with a biology or geology degree in creationism? DEAN: Not much of anything, I’m afraid. I guess that’s why you’re paying me $5 bucks to show you around. US: How many people visit the museum a year? DEAN: I believe the museum has close to 10,000 visitors a year, although we count pregnant women and Guardian Angels as two or three people, so that number may be inflated a bit. So the actual number of visitors who visit the museum probably boils down to five or ten people a year, and that includes the mailman, the fire marshal, and the UPS deliveryman as well. US: As we go through the front door, what can you tell us what we’re about to see? DEAN: When you first enter the museum, you’ll find yourself inside the gift shop. 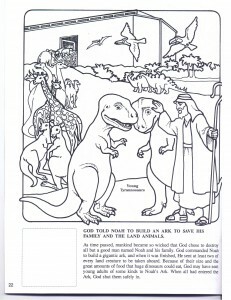 We have coloring books for children that teaches them how to avoid using logic. Then we have audiotape programs and books for the grown-ups that help people learn to become more intolerant of anyone who doesn’t look like them. All proceeds from the museum go towards supporting our churches, which usually means providing bail bond money to priests and ministers accused of molesting children. US: I notice the first exhibit is called Day 1 and shows pictures of stars and planets. What can you tell us about that? DEAN: As you know, the Bible says that God created the universe on the first day, so this part of the exhibit shows how he created the solar system. US: Does the Bible say anything about God creating other forms of life in the universe? DEAN: No, the Bible doesn’t specifically mention extraterrestrial life, but if life does exist on other planets, then it’s only logical to assume that God created them all at the same time. US: So if we could go back in time, we might see Adam and Eve in the Garden of Eden along with E.T., Darth Vader, and My Favorite Martian? DEAN: Yes, that is correct. If God created everything, then it’s only logical to assume that they all appeared in the Garden of Eden here on Earth. US: Why do you have a bunch of animals in this exhibit? DEAN: This shows the different types of animals God created. As you can see, God created the beaver and gave him transparent eyelids so he could see underwater, and flaps to cover his ears and nose when it’s underwater. That clearly shows that evolution is impossible. US: Just because a beaver has transparent eyelids, that means evolution is impossible? Then where did evolutionists like Charles Darwin come from? DEAN: God can create anything. That’s why we have war, suffering, poverty, torture, and mass starvation because God wants us to know that He’s loving, compassionate, and caring except for those times when He’s killing us, such as during the Flood. That’s what this next exhibit shows us, how Noah built the ark. US: Do you really believe it’s possible for someone to load every animal in the world on a single boat? DEAN: Of course. In fact, if God created every living creature on the same day, that means human beings and dinosaurs must have lived together at one time. 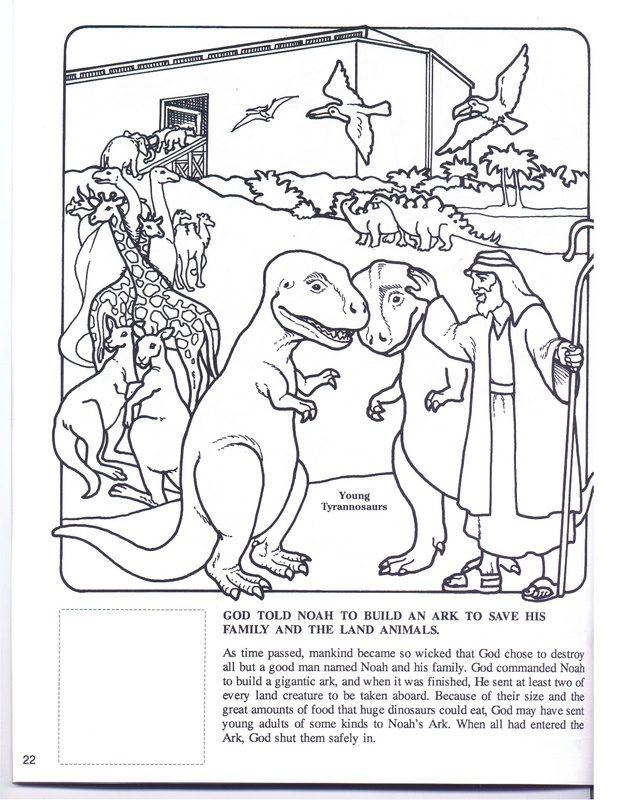 So it’s only logical to assume that Noah not only saved the giraffes and elephants, but he also saved the brontosauruses, stegosauruses, and tyrannosaurus rexes on his ark too. US: How can you fit two tyrannosaurus rexes on an ark? DEAN: We believe that all the animals on the ark may have gone into a state of suspended animation during the entire time, which would avoid feeding and cleaning of so many animals on a boat. US: So in other words, you believe God deliberately suspended the known laws of the universe just for the miracle of the ark to occur? DEAN: Exactly! Are you sure you’re not already a believer? US: If the world was completely flooded, where did all the water go when the floodwaters receded? DEAN: All the water went back into the oceans, naturally! That’s why the oceans are so big. Of course, some of that water wound up creating the Ice Age, and that’s our next exhibit right here. You see as creationists, we believe that all animals were created perfectly the way they are and that they never needed evolution to change or adapt to their environment in any way. US: So what does the Ice Age tell us about the history of life? DEAN: Since the Ice Age was obviously very cold, it’s only logical that animals would have to adapt by developing heavier coats of hair and fur and even grow bigger tusks and teeth like those found in a saber tooth tiger or a wooly mammoth. If animals didn’t adapt to the cold, they obviously didn’t survive. We believe that’s when all the unicorns died off along with the dinosaurs, mermaids, and the Easter bunny, during the Ice Age. US: This next exhibit talks about the Grand Canyon and Mount St. Helens. What’s the connection between these two events? DEAN: What we’ve observed at Mount St. Helens is that the land surrounding the eruption created canyons that look exactly like those found in the Grand Canyon. That proves that the Grand Canyon could have been created by a volcanic eruption in less than a day. So if the Grand Canyon couldn’t possibly have formed millions of years ago, that supports our belief that nothing on the planet is older than 6,000 years old. US: Is there any evidence of volcanic eruptions near the Grand Canyon? DEAN: Not yet, but when we do find some, we believe the scientific evidence will point to a volcanic eruption that occurred millions of years ago, if not billions of years ago. US: This next exhibit talks about the different religions found all over the world. What does creationism tell us about other religions? DEAN: It tells us that we’re right and they’re wrong. I’d hate to be a Muslim or a Buddhist the day Jesus comes back and takes us all to heaven. Wouldn’t you feel stupid being left behind by Jesus just because you backed the wrong messiah? US: Perhaps you could tell us about this next exhibit we’re looking at? DEAN: We’re looking at the pictures of evolutionists throughout history. There’s Charles Darwin and Andrew Carnegie. All of these men are currently burning in hell for eternity for questioning the infinite love of God. US: Do you think heaven is segregated or if I die, would I have to spend the rest of eternity sharing a room with a foreigner who smells funny? DEAN: Heaven is perfect in all ways, so everyone is always happy there. That’s why the Bible specifically forbids killing others or taking your own life because we don’t want people to get into heaven any sooner than they have to. That’s kind of like cutting ahead of the line. DEAN: When the Bible says “Thou shalt not kill”, what that really means is that you shouldn’t kill anyone who belongs to the same church. Everyone else is fair game. US: I see clocks and pictures of molecules everywhere. What does this next exhibit talk about? DEAN: One of the flaws of evolution is that they always rely on carbon dating to determine the age of fossils, which they claim can be millions of years old. But carbon dating is a flawed science that’s completely unreliable. That’s why we believe fossils are really only a few thousand years old. US: And how did you determine that fossils are only a few thousand years old? DEAN: Oh, we used carbon dating. That’s because carbon dating is the most reliable, time-tested, scientific method to accurately measure the age of any object. US: What’s the purpose of putting pictures of Karl Marx and Adolf Hitler on the walls? DEAN: That’s to show the consequences of evolution. You see, both communists and Nazis believe in evolution’s survival of the fittest, where the strong are allowed to kill and rule over others. If you believe in evolution, you’re indirectly supporting communists and Nazis. US: So if you believe in creationism, does that imply support for freedom and democracy? DEAN: Exactly! If this country would only let creationists run the government, we could invade other countries, kill all their leaders, and convert everyone to Christianity under the threat of torture and outright executions. We have to show that creationism is the stronger belief around, even if it means killing off all the weaker races and religions to prove it. US: It looks like we’ve reached the end of the creationism museum. Thank you for the tour. DEAN: It’s been my pleasure. I hope after seeing all of our exhibits showing the flaws of evolution, you’ve come away with a stronger sense that creationism is the only answer to how the world came about. US: Actually after seeing people who believe in creationism, it’s hard to believe that anyone involved with this museum could possibly evolve mentally, physically, or intellectually in any way, shape, or form. DEAN: We like to think that way too! US: Thanks Dean. If people want to visit the Institute of Creation Research, can you tell us when they can come visit? DEAN: The creationism museum is located at 10946 Woodside Avenue in Santee, California. They’re open six days a week, Monday through Friday from 9 am to 4 pm. US: If there’s one thing you want people to know when they leave the creationism museum, what would that be?